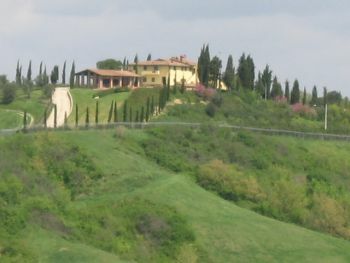 Luxury villa in west central Tuscany is private and superbly panoramic. The Mediterranean garden with its olive groves, cypresses, rose and lavender beds and aromatic shrubs offers spacious lawn areas with ample space for sitting and relaxing. An idyllic full circle panorama of olive groves, woodland, cypresses, cornfields, lakes and distant villages. 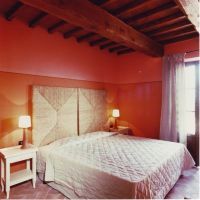 The villa sleeps 29 with 17 bedrooms and 15 bathrooms but can be rented with fewer bedrooms and still have use of the beautiful common areas as a private villa. 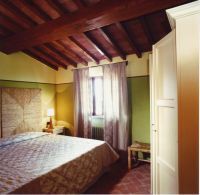 The Villa is on two levels and fully air conditioned. 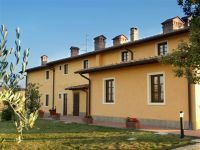 The main part of the Villa sleeps 12 with 3 bedrooms and 3 bathrooms off the reception area on the ground floor and 4 bedrooms and bathrooms on the first floor can be reached by an internal staircase. The main entrance is bright and welcoming. 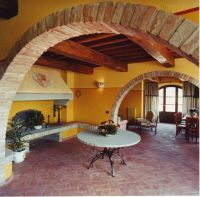 Stone arches lead to the sunny and bright yet airy and cool, southerly facing sitting rooms with typical Tuscan brick arches, grand master fireplace lounge and dining areas. Dining area opens open onto paved terraces through a façade of French windows. 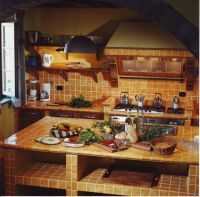 The large country kitchen with fabulous central work top area is equipped with high-tech Italian fixtures and fittings. 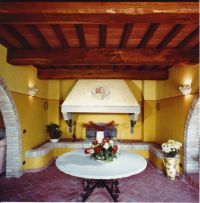 Tiled in dark yellow grés, the kitchen opens up on two levels with a work area and central work top on one floor and on a higher level a large pantry area. 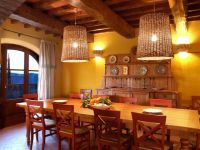 Fitted with state of the art equipment it is perfect for chefs, would be chefs and for holding great, hands-on cooking classes and demonstrations. 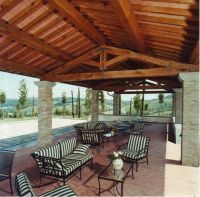 There is a south -westerly facing pool loggia (superb for parties and family gatherings!) equipped for dining and beautifully cushioned sofas and chairs for relaxing and a fantastically set-up BBQ area. 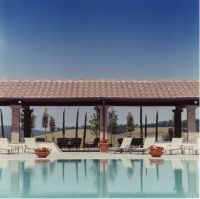 The views from the gardens and pool over the countryside are simply magnificent. Gentle steps and walkways lead down from the Villa to the mosaic tiled infinity pool with hydro massage area, and old stone paved solarium furnished with ample light sun beds.